The Colors of Marmoleum are so great. How to choose just one? Overwhelmed by All the Colors of Marmoleum? Even though we are overwhelmed by the patterns and Colors of Marmoleum we would like to use marmoleum click throughout our main hallway and through our open-concept kitchen / family room / den. How can people ever pick from all the choices of Marmoleum that are available. What are the most versatile shades and where is the best source of ideas and designs? Should the design be consistent throughout all of these areas? The rule of thumb is that when picking colors you should have something in each room that you absolutely love and start there. That first piece of the puzzle should be something you won’t consider changing. It can be furnishings, wall art, window treatments or the colors of Marmoleum flooring. As far as patterns go, many of the more varied samples are the older, original, marbleized linoleum patterns from 150 years ago. The really great news is that for 2013 Forbo has brought out whole new Generation of Colors. There are also embossed varieties, speckles and flatter, more mono-chromatic options too. Very simply….do you love any of them? Pick something and then test your other choices against it. Do you have to use the same color throughout for the floor? Usually a good indicator is whether the ceilings are continuous from one room to the next. If they are then the walls generally don’t have a logical place to change colors either. 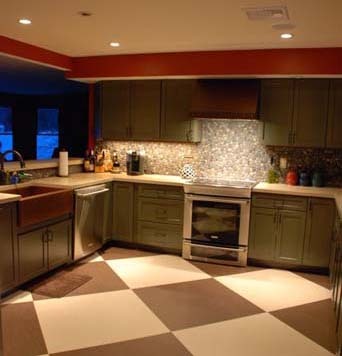 The floor color can be a unifying element from one room to the next or the colors can change and be complimentary. If you are brave with colors, you can pick contrasting colors but they usually require a more developed sense of style as to how to fill in the palette of colors so they all work together. It’s never bad to share pictures or ask for opinions, but you may as well own the decision, since you are going to live with it…. until you decide to repurpose your Marmoleum Click to another space. This entry was posted in How to Decide on a Color? and tagged cool, design, flooring, green, marmoleum, outlet, price, sustainable flooring on August 22, 2012 by MClique. How to Decide on a Color? I Never Heard of Marmoleum?